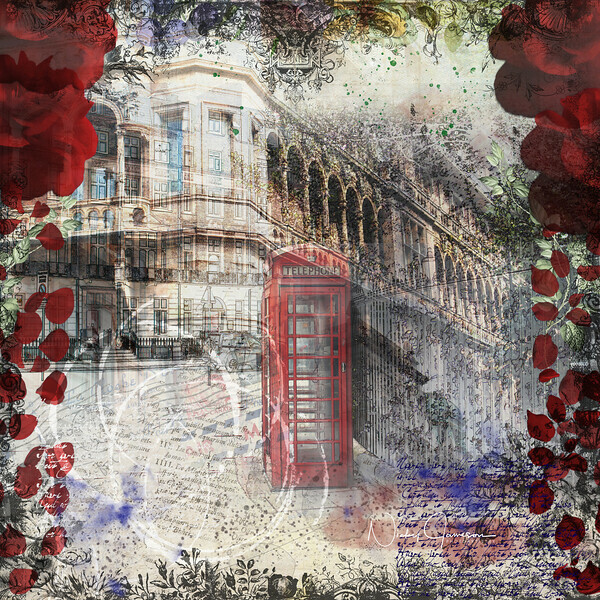 It's a weird feeling when bad things happen in places you happen to know well, and I know Russell Square in London very well and have great memories of lovely sunny days spent in the beautiful and peaceful little park just behind the telephone box in my composite. The architecture of the buildings in Russell Square is simply stunning too. So it was surreal following the events that unfolded that fateful evening knowing that it would never quite be the same. Russell Square became the latest hashtag. I created this artwork starting with four of my photos taken in Russell Square, beginning in 2013, 2014 and 2015. I had a vision for what I wanted to say, but initially struggled with how to say it and connect with the feelings through the art. In the end, rather than trying to control the direction I let my vision lead me in the direction it clearly wanted to go and felt my way through, keeping it essentially bold and grungy. There are over 60 different layers in this piece and each layer and element has a purpose and a place. "Russell Square" piece is designed to be a 12 x 12" canvas or metal print and is available for purchase in the shop!